Just some things I've been sniffing lately. Magic markers and glue not included. Just kidding. We've only been getting high off of latex paint fumes lately. We're so street. Not really. Like....at all. Basically, all we did this past weekend was cover ourselves in white paint and hope some made it onto the walls and trim. Now excuse me while I go scrub paint out of my hair. Then bathe myself in frou-frou water (my dad's choice words for perfume). 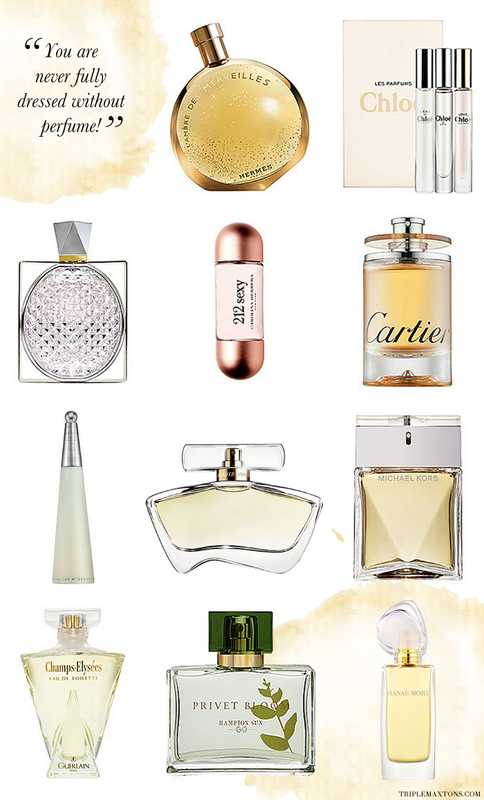 *I've been wearing these scents since high school! I've had Hanae Mori on my perfume shelf for years too! That new Stella McCartney bottle is beyond gorgeous, although I admit I haven't smelled it yet. I'm hoping it's worthy of that packaging! I'm a die-hard Chanel girl, been wearing Allure since high school and in the last few years acquired No.5 Eau Premiere (the original is a bit much for me) and the new Coco Noir, which has definitely become my favorite. I read somewhere that only Chanel and Hermes still use real flowers and scents, whereas all other perfumes have become mostly synthetic. There's something kind of old-school and special about that I thought, so I admit to being partial to those brands. Vera Wang Princess has been a favorite of mine for awhile but I love this light scent by Lollia (Calm) it smells wonderful and is not too heavy. Coco Mademoiselle right now for sure ;) so many complements. However, I had the Hanae Mori and oh my gosh so lovely! Love this post. I keep switching things up. I have worn 212 and Issey Miyake in the past. Right now I am into Chloe Love and the new one - eaudemoisell de Givenchy. It's really nice! All time favorite- classic chanel #5...or coco crystal- wonderful...however...jennifer aniston is very nice and smells like the ocean. I love the ocean.